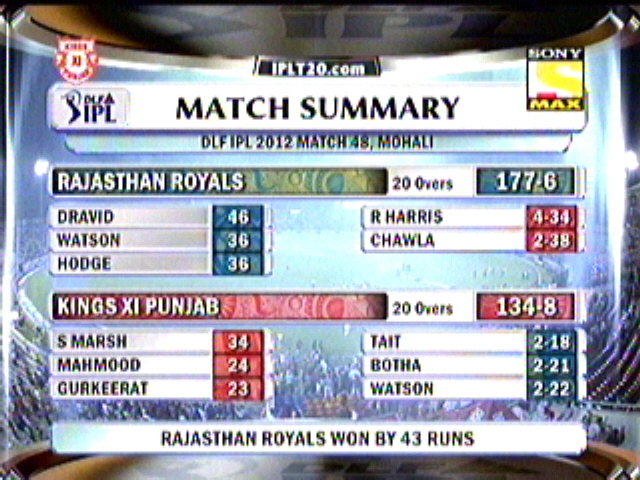 IPL 2: Day 31 Review..CSK Vs KKR..
Its 31st day in IPL 2. A game which will help CSK to sit pretty in the semi’s spot, KKR again a game for pride, they game dead close to win the game but lost it in the mortaza’s over. Dhoni won the toss and decided to bat first. This is the first game between KKR and CSK as the previous game was washed out without even a ball being bowled. Surprise, Man with Orange Cap, Hayden was given rest and George Bailey came into action in his place, (guess chennai thought KKR is an easy cake walk). Patel and Bailey had a solid start giving 60 runs in the power play overs. Just when things are looking good for patel, he has gone for a run out, then Bailey followed the same suit. But Raina and Dhoni was in no mood to relax, as they puched the ball with out any mercy, all over the fence, Raina made a effective 52 of 37 balls, before he skied a full toss ball to point fielder. Then after a long time Albie back in form hit some blistering shots, (man he got some power, good to see him back in form) for a cameo of 22*, which is also his best in this season. Bowling, nothing so specific worth mentioning as seen in the below picture. Dinda picked Raina tats all. Bowling only Murali showed his class stuff, just conceding 16 in his 4 overs. Which means KKR scored 173 in 16 overs, if u break down the innings of Dada, it further shortens to 169 in 13.4 overs, which means they scored at the rate of 12.31 to win the match. (169 runs in 82 balls, excluding murali bowling and dada batting)…. 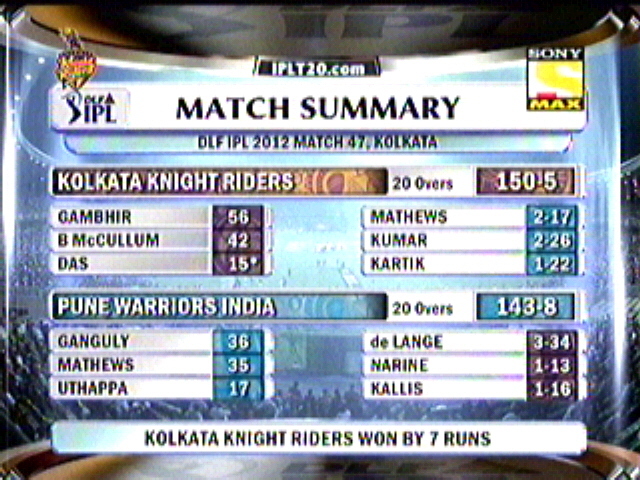 Gr8 effort but i think KKR back in form for no use. Hope they maintain till next season to get the roads to their way next year. Finally good see, McCullum signing the ball once for Vodafone start of the match and smiling in the presentation ceremony. Overall finally a reason for SRK to smile…. Chennai eventhough they lost match, as of now, it seem they can certainly make it to semi’s even they lose the match against KXIP. Can take the worst scenario. Delhi losing both, still in top with 18, which means MI and RCB get 2 points each, CSK losing to KXIP, means KXIP with 16 points qualify for semis, CSK will remain in 15. Rajasthan royals winning against KKR takes them also to 15 points, but as far as the net run rate is concern RR is in negative(-0.36), its not possible to get past Chennai who is well in positive(+0.93), which means they will be still ahead of RR’s. Now coming to last match , RCB Vs DC, both will be in 14 points in this stage, (provided RCB won the match against Delhi) , Who ever wins this match will go to semi’s. Even if the match doesn’t happen both will get 1 point and it will be 15 all, even then, net runrate will take chennai into semi’s. Think of a scenario, where RR can get in, by pulling RCB and DC. if RCB loses against delhi, they can’t qualify to semi’s, but if they defeat DC, it means both will still in be 14 points, which will allow RR to go to semi’s provided they have beaten KKR. 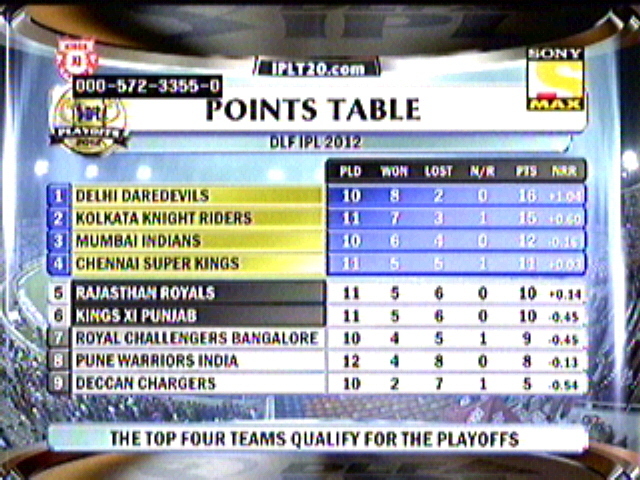 Real fun comes, when RR loses, KXIP loses, RCB loses against delhi alone and Deccans lose. 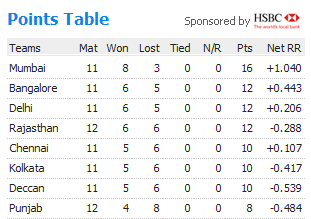 All KXIP, RCB and DC will be in 14 points, which means as of now, DC and RCB can qualify for semi’s with net runrate. – 189, Highest ever total in IPL 2, its also the highest T20 total in Supersports ground. – Highest ever successful chase in IPl 2. – 377 is also the highest total aggregate in IPL 2. – Brad hodge with 359 runs becomes the top scorer. – McCullum with 12 sixes took over gayle in the topper list for KKR. – 90 is the highest 2nd wicket partnership(McCullum and Hodge) for KKR. – 56* is the highest 4th wicket partnership(Hodge and Saha) for KKR. – MCCUllum 50 of 21 balls, equalled the record of fastest fifty by Yusuf pathan. – Albie Morkel scored his best figures 22* for this IPL season. – Out of 81 runs McCullum scored 62 runs came of boundaries and sixes, which is the third highest in the tournament, list is topped by Devillers. – Economic rate of 8.58 make balaji the worst bowler for Chennai.